Authoritative and comprehensive, this volume provides a contemporary psychodynamic perspective on frequently encountered psychological disorders in adults, children, and adolescents. Leading international authorities review the growing evidence base for psychoanalytic theories and therapeutic models. Chapters on each disorder examine its etiology and psychological mechanisms, discuss diagnostic issues, and thoroughly describe effective treatment strategies. Highly accessible, the book is richly illustrated with clinical case material. It demonstrates ways in which psychodynamic theory and therapy are enhanced by integrating ideas and findings from neuroscience, social and personality psychology, cognitive-behavioral therapy, and other fields. "Bringing together some of our most distinguished psychoanalytic clinicians and researchers, this volume is a rare treasure trove of contemporary psychodynamic thinking and practice rooted in an evidence-based framework. It is set to become essential reading for mental health professionals in training and beyond." "This volume is a landmark contribution and an essential resource for all clinicians, researchers, and trainees. Leaders in the field provide the most comprehensive, up-to-date synthesis currently available of relevant research and its implications for psychoanalytic theory and practice. The Handbook will become the standard reference in this area and will have a significant impact on the way in which the broader mental health field approaches the etiology, conceptualization, classification, and treatment of psychological and psychiatric problems." 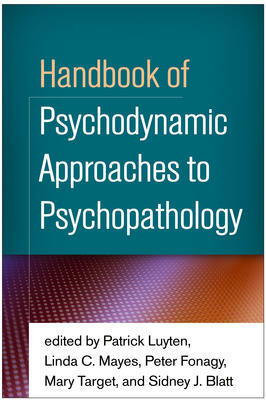 "This magnificent handbook not only demonstrates the tremendous richness of psychodynamic thinking about psychopathology, but also links it to empirical research and to neighboring disciplines like personality and social psychology, psychiatry, and neuroscience. I highly recommend this unique volume to anyone interested in the empirical validation of contemporary psychodynamic concepts." "From stellar editors and contributors, this impressive volume is a thoughtful gift to the field. Its perspectives on psychopathology are cutting edge and empirically supported. Readers from graduate students to senior clinicians and researchers will find this book invaluable." Patrick Luyten, PhD, is Associate Professor in the Faculty of Psychology and Educational Sciences, University of Leuven; Reader in the Research Department of Clinical, Educational, and Health Psychology, University College London; and Visiting Professor at the Yale Child Study Center. His research focuses on the role of personality, stress, and interpersonal processes in depression, chronic fatigue syndrome, and fibromyalgia. He is also currently involved in studies on mentalization-based treatment of patients with borderline personality disorder. Dr. Luyten serves on the editorial boards of several scientific journals and is a recipient of the Psychoanalytic Research Exceptional Contribution Award from the International Psychoanalytical Association. He also maintains a private practice. Linda C. Mayes, MD, is the Arnold Gesell Professor of Child Psychiatry, Pediatrics, and Psychology in the Yale Child Study Center and Special Advisor to the Dean, Yale School of Medicine. Dr. Mayes's research integrates perspectives from child development, behavioral neuroscience, psychophysiology and neurobiology, developmental psychopathology, and neurobehavioral teratology. Her work focuses on stress-response and regulatory mechanisms in young children at both biological and psychosocial risk. She also focuses on how adults transition to parenthood and the basic neural circuitry of early parent-infant attachment. She and her colleagues have developed a series of interventions for parents, including Minding the Baby, an intensive home-based program, and Discover Together, a program to enhance community and family resilience. Peter Fonagy, OBE, FMedSci, FBA, PhD, is Freud Memorial Professor of Psychoanalysis and Head of the Research Department of Clinical, Educational, and Health Psychology, University College London; Chief Executive of the Anna Freud Centre; Consultant to the Child and Family Program at the Menninger Department of Psychiatry and Behavioral Sciences, Baylor College of Medicine; and Visiting Professor at Yale, Harvard, and Emory Medical Schools. Dr. Fonagy's clinical interests center on early attachment relationships, social cognition, borderline personality disorder, and violence. With collaborators in the United Kingdom and United States, he co-developed an innovative research-based dynamic therapeutic approach, mentalization-based treatment. He has published more than 400 scientific papers, 250 chapters, and 17 books. Mary Target, MSc, PhD, is Professor of Psychoanalysis in the Research Department of Clinical, Educational, and Health Psychology, University College London; Clinical Professor at Yale Medical School; and Visiting Professor at the University of Vienna. She has held several leadership positions in psychology and psychoanalytic organizations. She has a half-time psychoanalytic practice, with clinical interests in early attachment relationships, personality disorders, and disturbances of adult attachment and social cognition. Dr. Target's research interests include child and adult attachment and mentalization, treatment outcomes in children and adolescents, and the development and evaluation of models of psychotherapy. She has published more than 100 scientific papers and 11 books in collaboration, many with Peter Fonagy. Sidney J. Blatt, PhD, until his death in 2014, was Professor Emeritus in the Departments of Psychiatry and Psychology at Yale University. He was a Life Member of the Western New England Institute for Psychoanalysis. Dr. Blatt published extensively in a wide range of journals in psychology, psychiatry, and psychoanalysis, and authored several books. He was a recipient of the Mary S. Sigourney Foundation Award for distinguished contributions to psychoanalysis, among other honors.